As per usual, I've got a lot of displays to share, so let's get right to it, starting with a few Halloween things I didn't see until after I did my last display post, which is unfortunate as that focused on Halloween things. 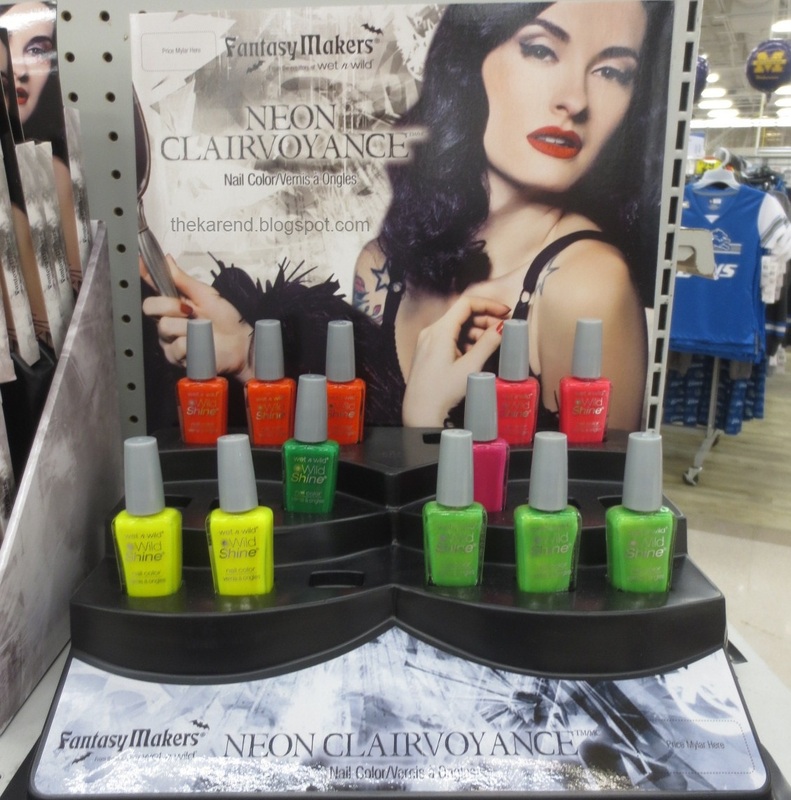 Moving on to Fantasy Makers stuff I hadn't seen in any display variation before, Meijer had the Neon Clairvoyance collection. 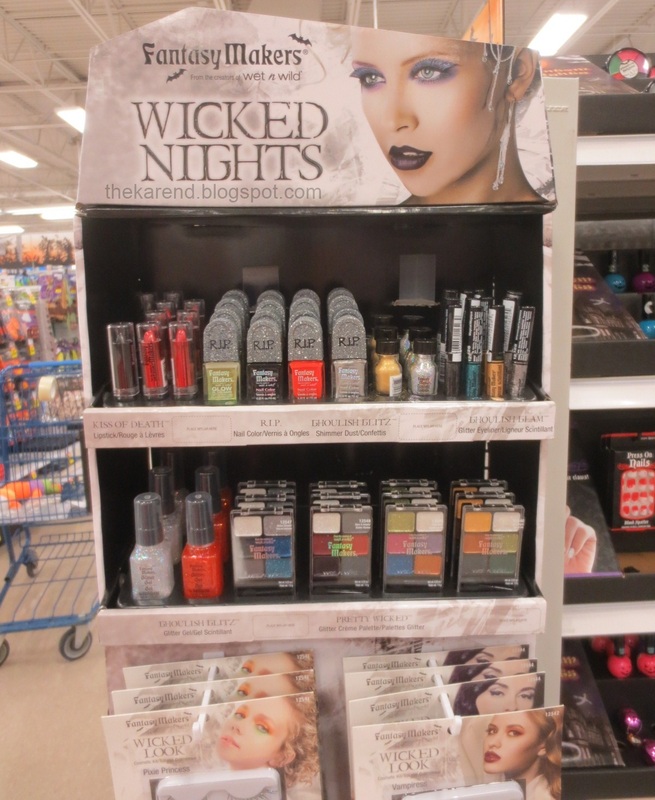 Even though the display had the Fantasy Makers branding, with a photo of the same dark haired model as others of their displays, the polishes here were in regular Wet 'n' Wild Wild Shine bottles. There are six neon colors here: Werewolf Vision (yellow), Ghoul Time (lime), Frank is Mine (green), Jealous Lover (purpley pink), Jailhouse Shock (orange red), and Vengeful Bride (warm pink). 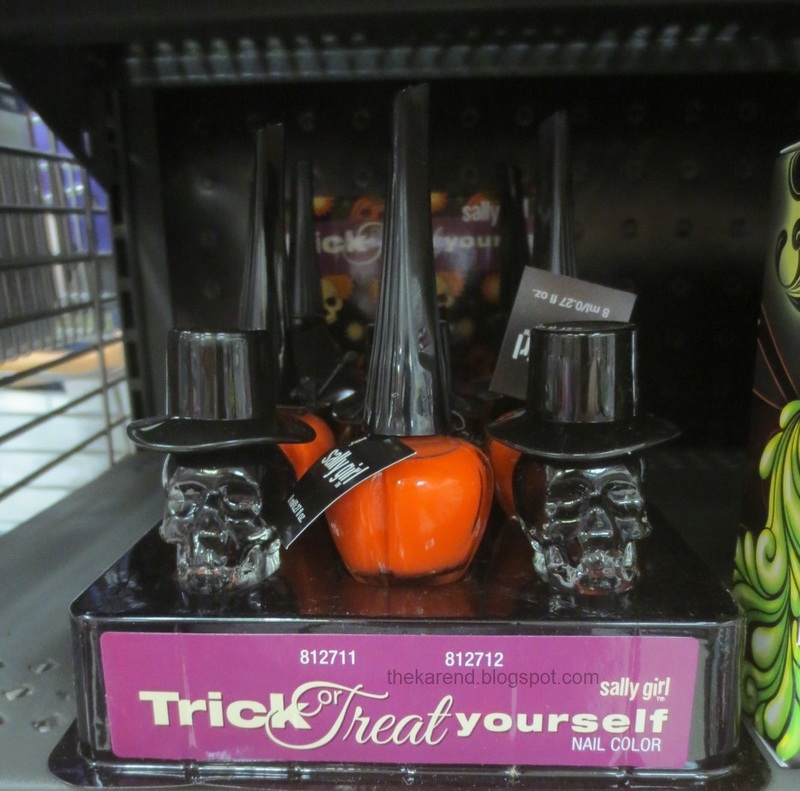 Tucked into a shelf away from the usual nail polish area at Sally Beauty, I found a Sally Girl Trick or Treat Yourself display with two colors in fun bottle shapes: a skull with black polish and a pumpkin with orange. I don't know if the Disney Villains collection at Walgreen is considered Halloween merchandise—probably not because it didn't show up in stores until late September or early October, four to six weeks after most Halloween products appeared. Regardless, it seems to fit in with the theatrics of Halloween. 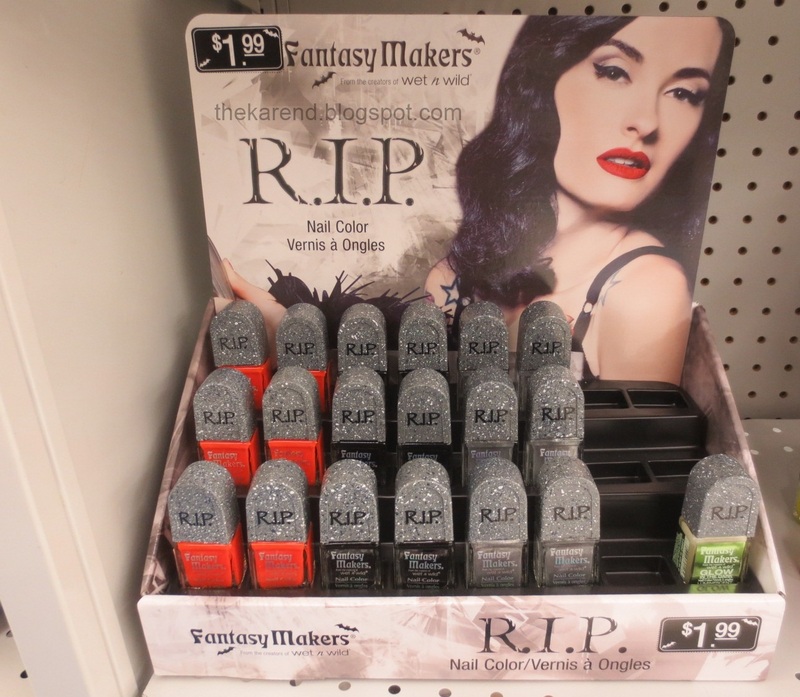 The nail polish portion of this collection consists of a cube with twelve mini bottles from elf, a trio for each of four Disney baddies: Cruella de Vil, Ursula, the Evil Queen (a.k.a. Snow White's stepmother), and Maleficent. 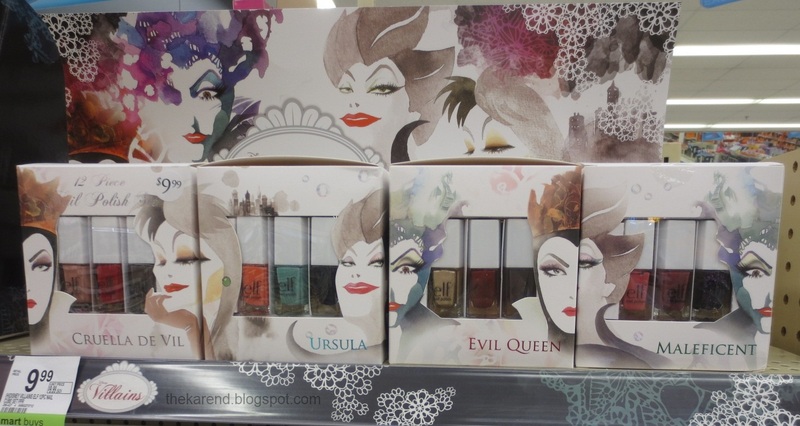 The draw here is the packaging—I see now that I should have swapped the left two boxes before I took the photo so Ursula and Maleficent could have matched up like Cruella did. I know at least some of the colors in here are not new, as they match ones in the set I got at Target last Christmas; I suppose I should be glad they didn't just rename them with a villain theme to try and fool me. 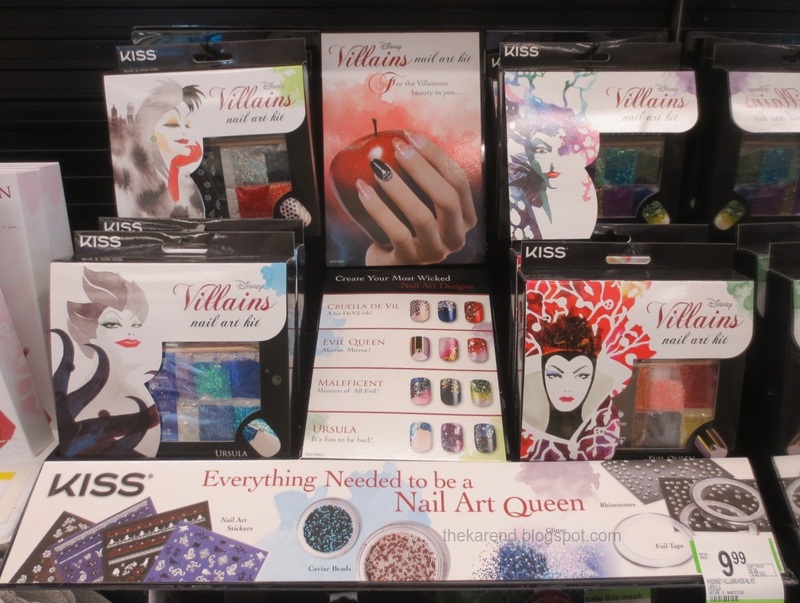 Some but not all of the Walgreens stores have Disney Villains nail art kits from Kiss as well, one for each of the ladies. 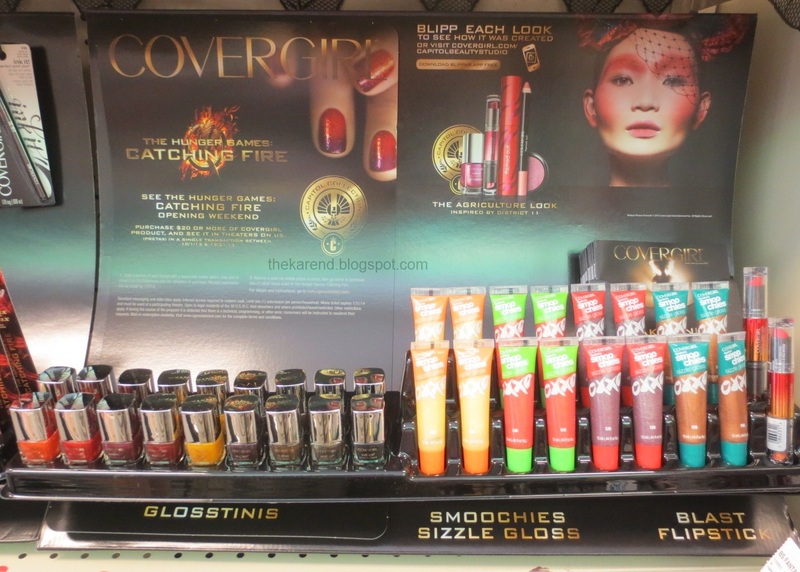 REMINDER: My Cover Girl Hunger Games giveaway ends tomorrow, October 23rd. 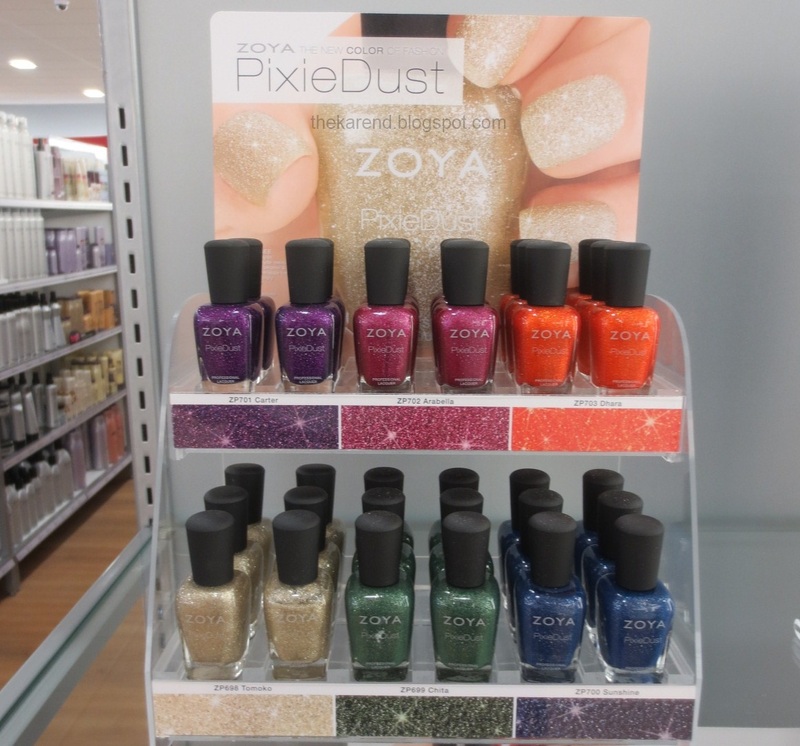 I'd seen the Zoya Fall PixieDust polishes before, but hadn't seen the display until I came across it at Ulta earlier this month. At Sally Beauty, they had a smaller version of the Orly Surreal collection display than I'd seen back in August; it still had all six colors in it, though. 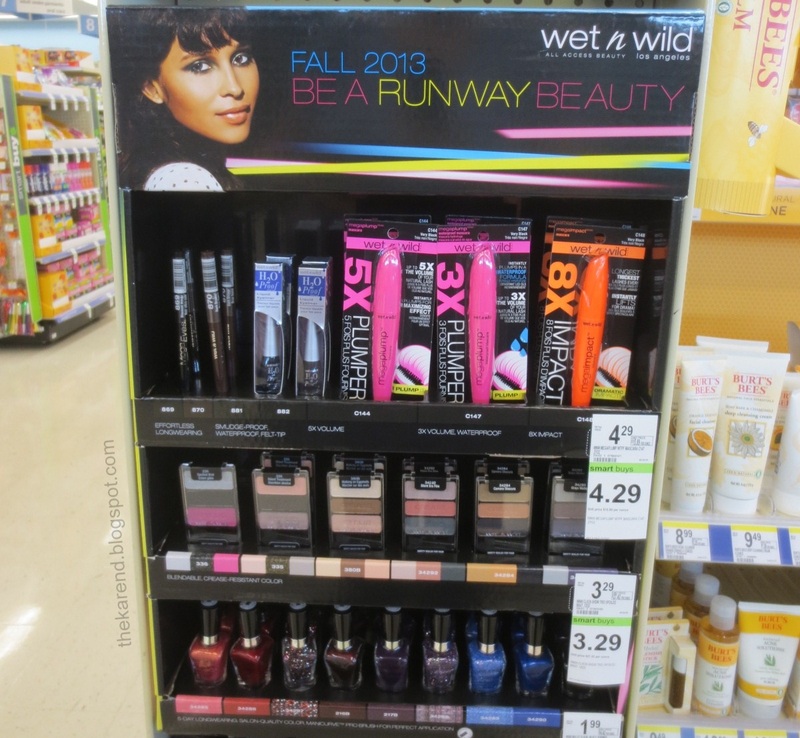 Walgreens had the Wet 'n' Wild Fall 2013 Be a Runway Beauty display before, with some Megalast polishes included. A couple shades I'd seen before, as they're core; the others were new to the Megalast line but some look quite a lot like colors in other Wet 'n' Wild lines, which doesn't surprise me at all. Shades here are: Rudy-dolph, I'm Not Shrimpy, Under Your Spell (core), In Too Deep, Playing All Suits, Disturbia (core), Violet Attack, Up in the Air, and Sea Ya Soon (hidden behind the eyeshadow price sticker hanging down). I wish I'd taken the time to turn all the bottles so the white print on the cap faced forward. 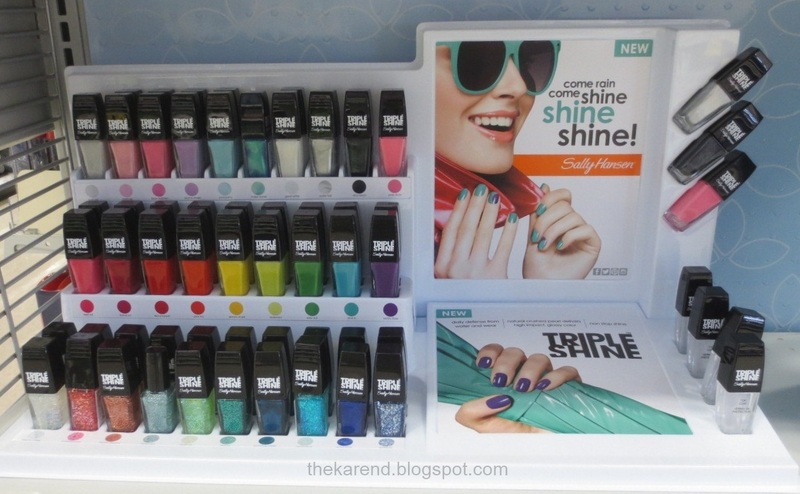 You might have already noticed that in the bottom row, someone has already take off the removable outer cap from one of the bottles; maybe they thought they were doing everyone else a favor by showing off this new to Sally Hansen feature? Colors, top row: Bait Me, Clam Up, Blow Bubbles, Drama Sheen, Pool Party, Make Waves, Great White, Oyster Bar, Slick Black, Pixie Slicks. Middle row: Reef-Raf, Flame On, Red Snapper, Play Koi, Lemon Shark, Statemint, Kelp Out, Dive In, Vanity Flare. Bottom row: Pearly Whites, Twinkled Pink, Dream Sequins, Fanta-sea, Scale Up, Seanic, Sparkling Water, Hypnautical, Wavy Blue, Sparks Fly. 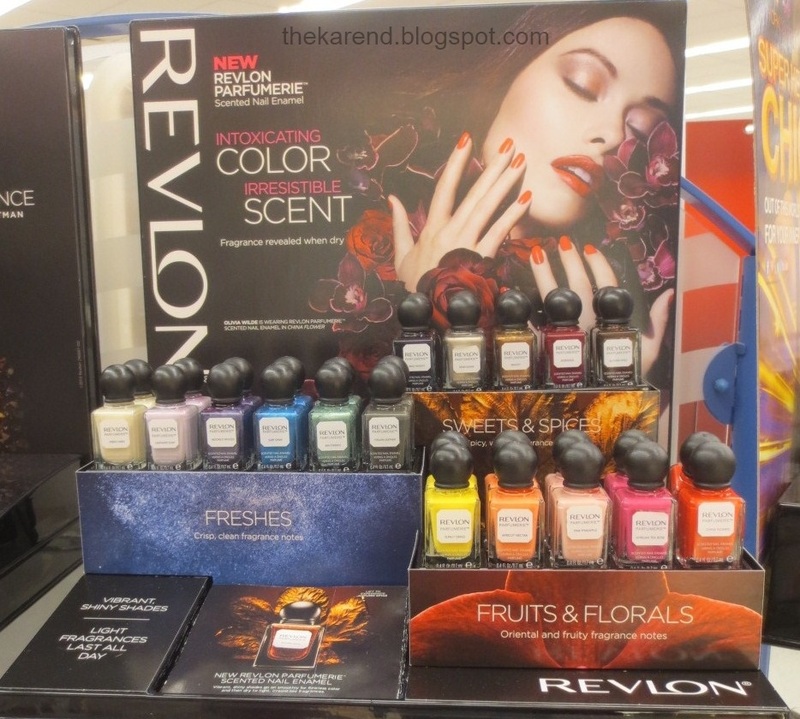 Revlon has a new line, too: Parfumerie, scented polishes in square bottles with round caps. I first saw these at Bed Bath & Beyond but soon after they showed up at CVS and Rite Aid, too. I've seen two different displays. First, there's a shelf top with 16 colors divided into three groups: Fruits & Florals, Freshes, and Sweets & Spices. I haven't noticed a lot of consistency in which colors are in which group at different stores, so I'm not sure which colors Revlon intended to go in which group. I can tell you which ones are where in this particular version, though. Fruits & Florals: Sunlit Grass, Apricot Nectar, Pink Pineapple, African Tea Rose, China Flower. Freshes: Fresh Linen, Lavender Soap, Moonlit Woods, Surf Spray, Watermint, Italian Leather. Sweets & Spices: Wild Violets, Spun Sugar, Beachy, Bordeaux, and Autumn Spice. Based on the name, I'd move a few of those to different groups for sure, but I think the groupings work nicely by color the way they're arranged here. 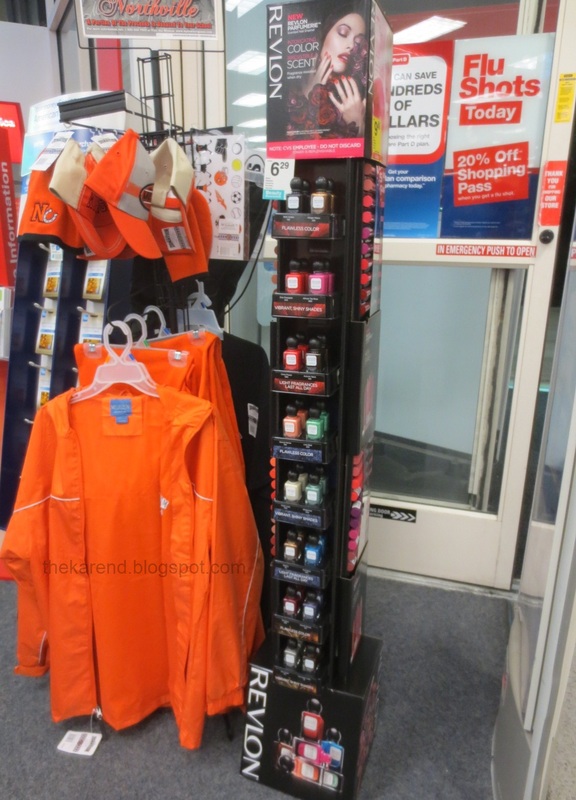 The above was at Rite Aid (I saw similar at BB&B); at CVS I found a free standing tower display which also had 16 colors, but not the same 16. This had three colors not in the other display: Ginger Melon (which appeared to be sold out, as its slot was filled with Beachy), Lime Basil (bright green), and Chocolate Truffle (brown). There were no slots for Sunlit Grass, Lavender Soap, or Italian Leather. 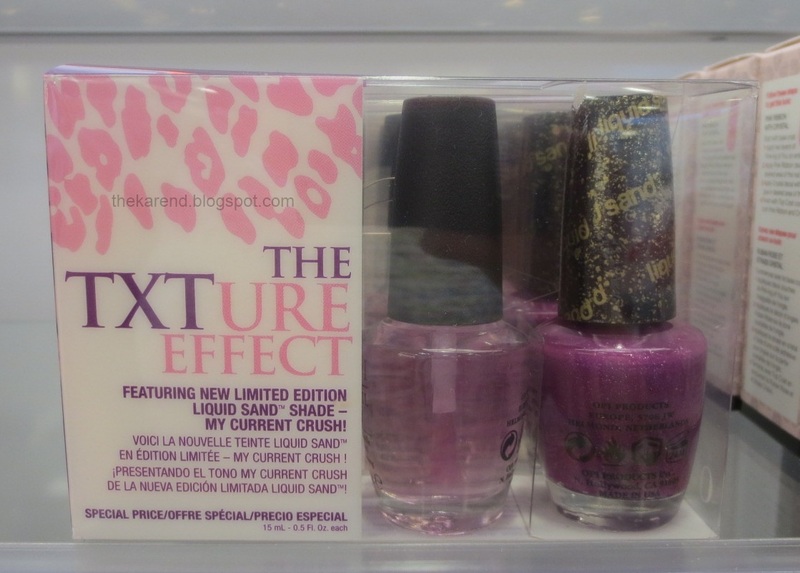 OPI has extended their Liquid Sand line with a limited edition shade My Current Crush, which I saw at Ulta in The TXTure Effect set, which has the polish and their Natural Nail Base Coat. My Kroger grocery store is the only place so far that I've seen the Nicole by OPI sets with one Selena Gomez color (Scarlett or Pretty in Plum) and one mini called Gumdrops (on the front of the box) or Silver Gumdrops (on the back), which is confusing. This silver is not any of the colors that were in the Nicole by OPI Gumdrops collection. According to the back of the box, this Gumdrops is a textured glitter, too. Ulta is the only polace so far that I've seen Essie's winter collection (some of my drugstores still have the summer one hanging around next to the fall colors). Six shades here: Shearling Darling, Mind Your Mittens, Toggle to the Top, Sable Collar, Warm & Toasty Turtleneck, and Parka Perfect. 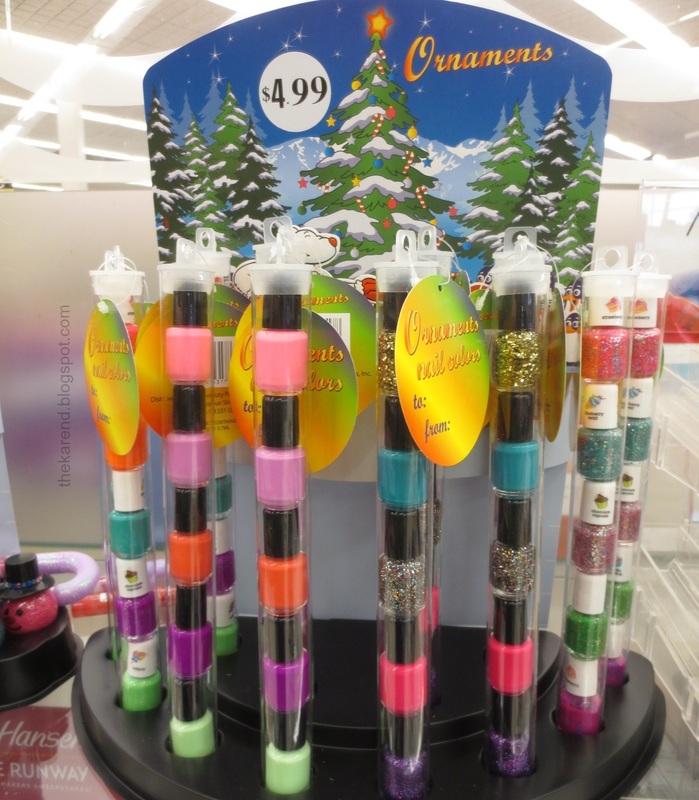 I've come across two holiday displays from Sinful Colors, both at Rite Aid. The first is Glitz & Glittered, with six new glitters and two old ones. Shades are: Gilded (new), Holiday Rebel (new), Decadent (new), Full Spectrum (new), Unwrap Me (new), Ice Dream, Charmed, Silver Belle (new). 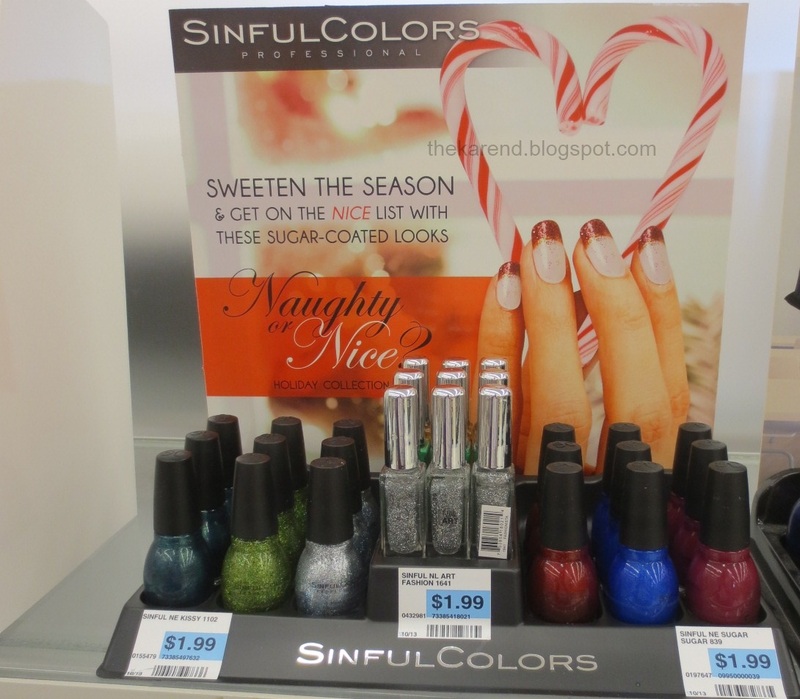 The second Sinful Colors holiday display I've seen is Naughty or Nice, which has six polishes and three nail art colors. Polishes are: Kissy, Call You Later, Ice Dream, Sugar Sugar, Blue by You, and Aubergine. I don't recall seeing Aubergine before, but it's quite possible they slipped it into the core display when I wasn't looking. The nail art stripers are a silver glitter, a green shimmer, and a gold shimmer. Why they weren't put into the display with the all three colors in the front row, I don't know (the next time I ran into this display, I did rearrange them, but didn't get a photo for some reason). 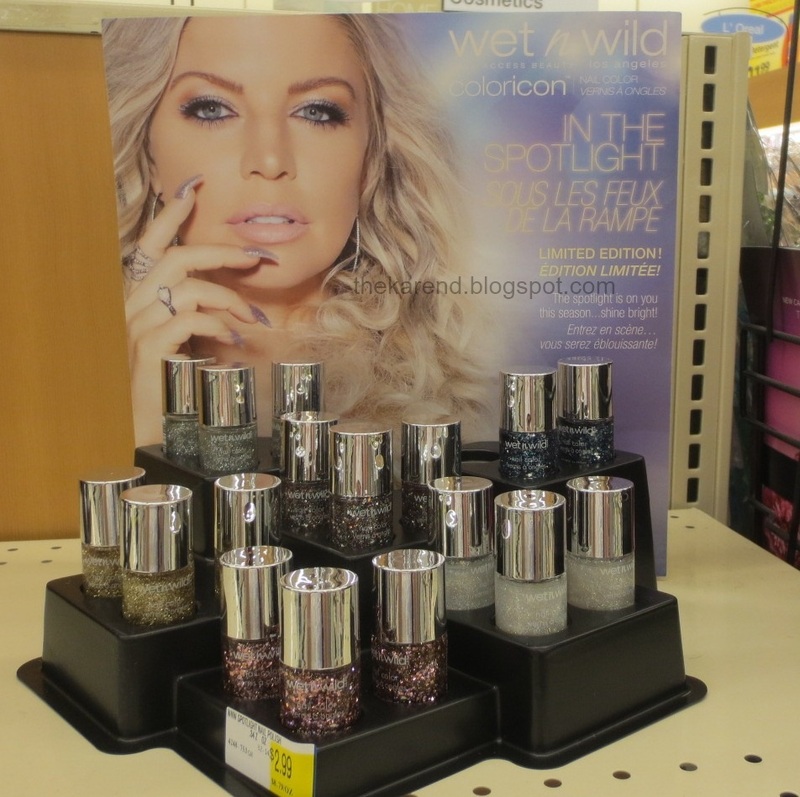 Wet 'n' Wild has a Color Icon glitter collection for the holidays called In the Spotlight. I've only seen this at Jewel Osco in Chicagoland so far but I expect it will be turning up here in Michigan at some point soon. Because this is Wet 'n' Wild, I wouldn't be surprised to find that some or all of these are all rebottles from other lines. Colors are: The Golden Rule, Social Circles, Seeing Stars, Silver Linings, At the After Party, and Cruisin' the Blvd. The snowmen from Blue Cross (sold under the Ornaments name) are back again, and this year they've blinged out their hats with rhinestone bands. That touch helped distract me from my annoyance that Christmas stuff is in stores before Halloween now. 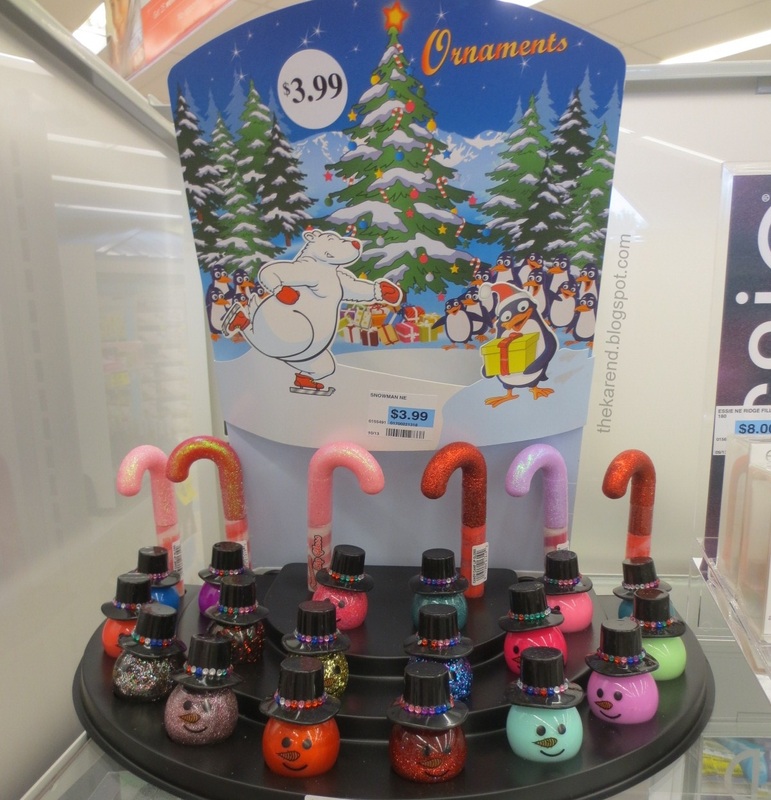 The snowmen brought along some tubes of mini polishes with them under the Ornaments banner. There are four different sets of colors, two of them scented. That'll do it for today's shopping excursion. You might have noticed we skipped the pink sections for Breast Cancer Awareness month. Maybe I'll do a separate entry on those before the month is out or maybe I'll just trust those who want to see them will find them elsewhere. I have decidedly mixed feelings about pink nail polish in October. 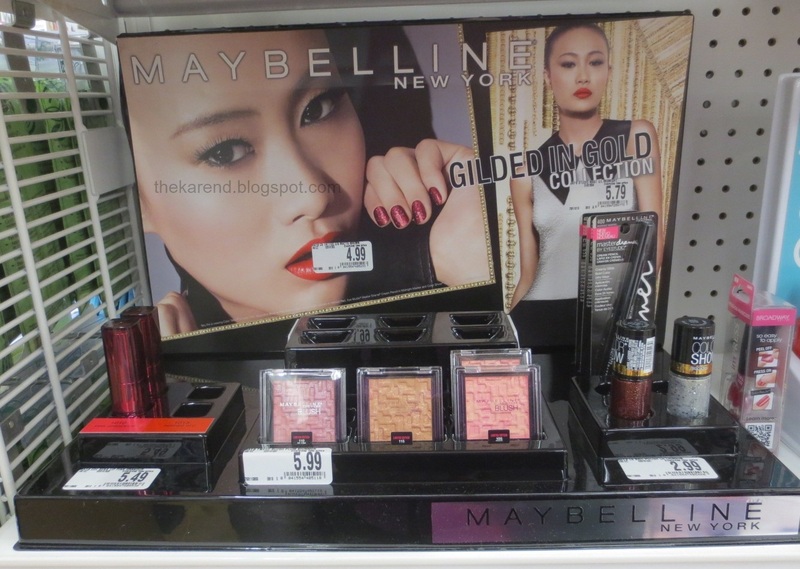 There are several displays I have been keeping an eye out for but haven't seen yet, including the rest of the Maybelline Gilded in Gold Brocade polishes, Sinful Colors Crystal Crushes, NYC Disco Inferno (really afraid I missed this one), and the new holiday colors of Julie G Frosted Gumdrops. 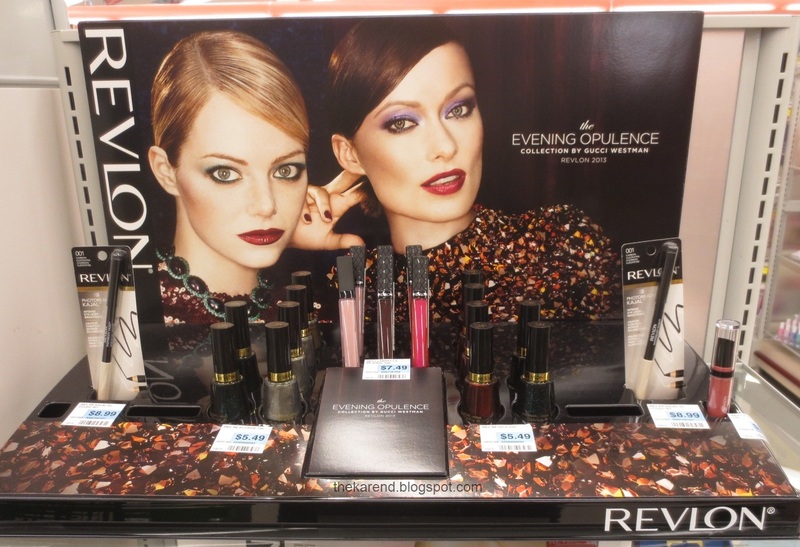 Gotta find that Revlon display here, totally want to check out those scented polishes! And those snowmen are so cute! Too funny that they're blinged out this year! I am boycotting pink-for-October stuff. I'm sick of it. -- And I'm going to have to give a donation to some breast-cancer charity so I can avoid feeling guilty for even saying that out loud! Wow, I really like these posts even though I can't find most of the polishes...or maybe that's why I like them. I love these posts. Thank you for doing them! Yes! I love this post! I cant believe Christmas stuff is out already! I have been looking for the Villains at Walgreen's since last month and still haven't found it here. I am going to look again. 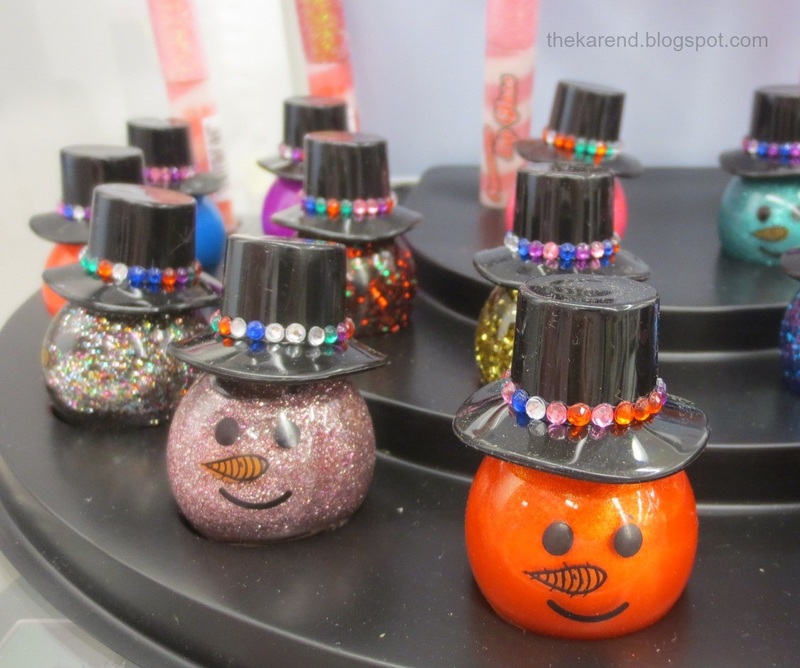 I'm anxiously awaiting the new Julie G frosted polishes myself...and those blinged out snowmen are beyond adorable! Probably just a ploy for us to buy colours we already have! Aw there are so many cute bottles!